Two weeks ago was the Jeûne Fédéral in Switzerland and according to the tradition a plum tart should be the only food for lunch that day. Since I had a day off I decided to make a plum tart two ways: one tart with fruits only and one with a cream-egg filling on top of the fruits. Both were very good, but my favorite is the plain fruit tart, which is also much more appealing to the eye I find. Mix salt, sugar, flour in a bowl. 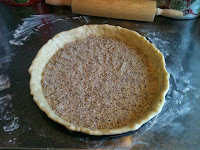 Add butter and mix with your hands to make crumbs. Add water and mix rapidly with a wooden spoon. Refrigerate the dough under cover for at least 30 min. 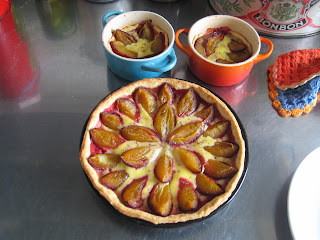 Clean the plums and cut them in four quarters. 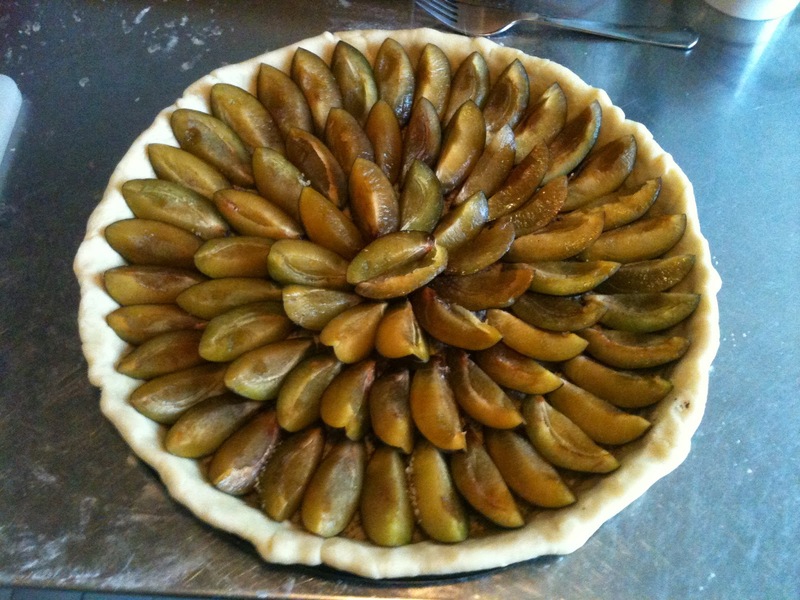 Prepare a tart form by buttering and flouring it. Roll out the dough on a floured table and transfer to the tart form. Prick it with a fork. Cover the dough with ground hazelnuts. 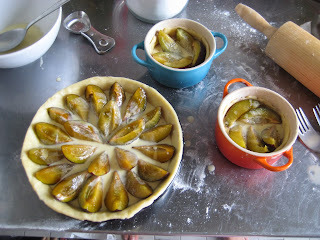 Place plum quarters tightly next to each other and sprinkle them with sugar. 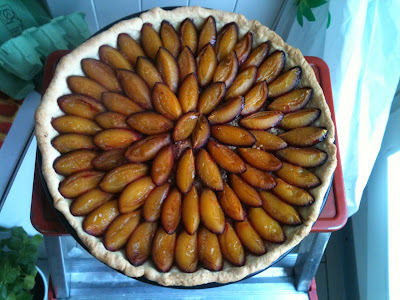 Bake in the oven 30-40 min at 200 C.
Enjoy it lukewarm and serve it with some whipped cream! Half all the ingredients and follow the recipe above. 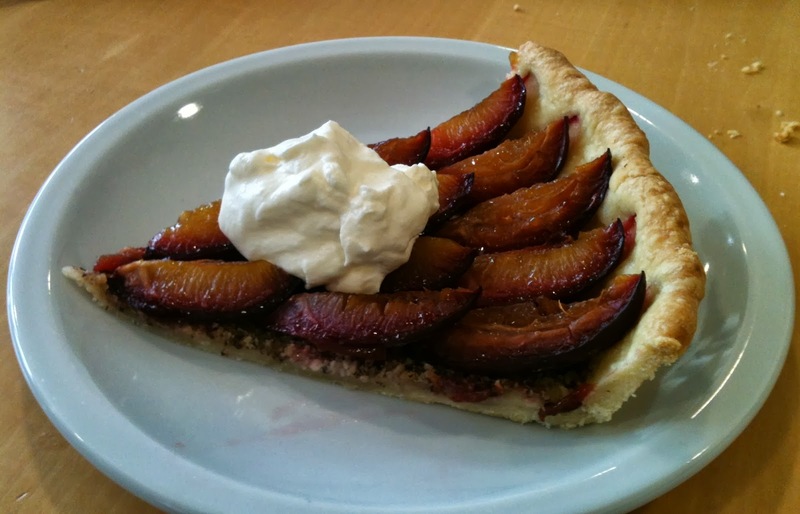 After placing the plums on the tart, mix egg, cream, and sugar, and pour on the fruits. Bake as described above.